Importance. - The golfball-size galls that form on eastern redcedar (alternate host) are unsightly, but cause little harm to the tree. The primary hosts-apples-experience foliage loss, growth loss, reduced quantity and quality of fruit, and, in some cases, death. Identifying the Fungus. - The fungus forms galls on the branches of eastern redcedar. 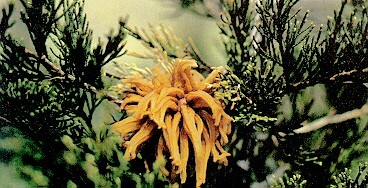 In the spring, these galls produce long, orange tendrils or "horns." Leaf spots form on the apple host in the spring. 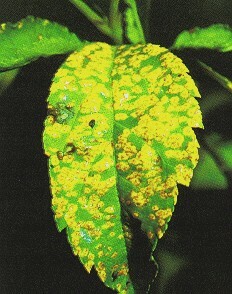 These spots produce yellow spores on the lower surface of the leaf. Identifying the Injury. - Brown, round galls form on the branches of redcedar, but they cause no injury. On apple leaves, yellow spots occur that later turn brown and result in cupping and curling of the leaf. Biology. - The redcedar needles are infected in the summer by aeciospores from the apple host. The next spring, brown galls begin to appear on the needle. Later, larger brown galls, with small round depressions, form on the twigs. The next spring orange,jellylike horns (telia) protrude from these galls. Spores, produced in these horns, infect the apple host, which results in leaf spots and the production of aeciospores. Control. - Picking and disposing of the galls can improve the appearance of the redcedar. The stage on apple is generally controlled with fungicides. Reducing the number of eastern redcedars may reduce the occurrence of the disease on apple.